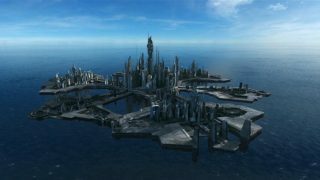 SG-1 gates to BP6-3Q1, a planet with cities at least as advanced as those of Earth. But the people are gone, the city deserted. The team quickly discovers why: a swarm of huge and aggressive insects fly towards them. One lands on Teal’c’s back, and stings him before Colonel O’Neill can shoot it. The team flees from the swarm and escapes back to Earth, but Teal’c is not in good shape. At the suggestion of Captain Carter, they call in Dr. Timothy Harlow, a leading geneticist with whom Carter had once worked. The insect’s venom, it seems, is rewriting Teal’c’s own DNA. It is the alien’s way of reproduction: the victim’s own DNA is rewritten, until nearly a dozen new bugs burst forth from his corpse. Colonel Maybourne appears on the scene (he was notified by Harlow, who is not as trustworthy as Carter believed he would be), and takes Teal’c out of the S.G.C. facility for further study. As they travel away from Cheyenne Mountain, Maybourne reveals to Harlow that he wants Teal’c transformation to run its course. His desire is not to cure Teal’c, but to study the insect venom as a potential biological weapon. Teal’c has other ideas. He is beginning to lose his mind because of the venom’s effects, and he renders the men unconscious and — after removing his larval Goa’uld and depositing it on the van floor — escapes into the woods. The race is on to find him. O’Neill wishes to bring him back to the S.G.C. for treatment, while Maybourne (with superior forces and jurisdiction) wants to capture and study Teal’c. At the request of Dr. Harlow, the rest of SG-1 returns to the alien world and captures another insect for study. Harlow and Dr. Fraiser study the bug and determine a cure for Teal’c’s ailment. They also manage to keep his larval symbiote alive in the laboratory. Hiding in a dark, abandoned building, Teal’c is befriended by a neighborhood girl — herself a misfit. Ally helps Teal’c hide from Maybourne’s men, and brings him candy bars to eat. Finally, she realizes that his transformation can’t be what he really wants. She contacts Colonel O’Neill, who comes for his friend. Curiously, O’Neill, Carter and Jackson return to the alien planet without any additional protection from the insects or their venom. To form the golden emblem on the forehead of a Jaffa, the skin is cut with a special knife, and molten gold is poured into the wound. Larval Goa’uld can be temporarily maintained outside the Jaffa body by simulating the conditions within the body, including temperature, nutrient balance, and a slight electrical current. 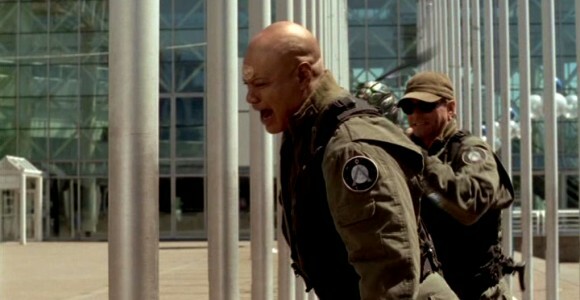 Teal’c – Teal’c was near death, and asked O’Neill to kill him rather than allow him to transform. Teal’c also removed his Goa’uld symbiote and left it for dead — perhaps because he was trying to kill himself. VOTE! How would you rate SG-1's "Bane?"